Ecuador has partially restored Julian Assange's communications in their London Embassy after UN officials met with Ecuador's president, Lenin Moreno on Friday, reports the Belfast Telegraph. Assange, who has lived in the embassy for over six years, had his phone and internet access taken away in March over political statements he made in violation of "a written commitment made to the government at the end of 2017 not to issue messages that might interfere with other states." His visitor access was also limited to members of his legal team. "Ecuador has told WikiLeaks publisher Julian Assange that it will remove the isolation regime imposed on him following meetings between two senior UN officials and Ecuador’s President Lenin Moreno on Friday," WikiLeaks said in a statement. Assange, having been granted political asylum by Ecuador, will not leave the embassy out of the belief that he will be arrested by UK authorities and extradited to the United States, where a Clinton-friendly DOJ awaits the arrival of the man Hillary once "joked" about murdering via drone strike. 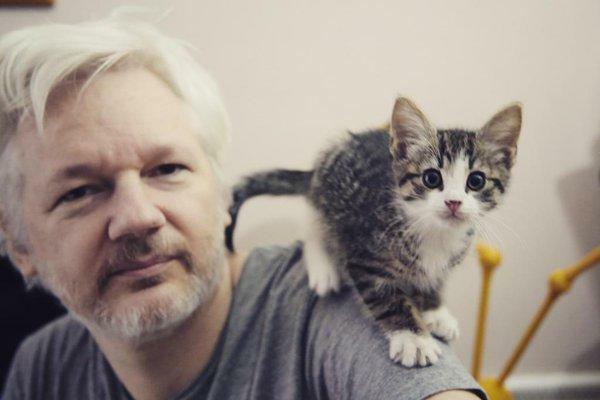 WikiLeaks' statement said that the meetings which resulted in the partial restoration of Assange's communications were held between President Moreno, the UN high commission for refugees, Filippo Grandi and UN special rapporteur for freedom of expression, David Kaye. "Concern over Mr Assange’s situation has also been raised by other UN bodies, as well as Human Rights Watch (who was refused access to him), Amnesty International, the Inter-American Court on Human Rights, Ecuador’s Permanent Human Rights Commission, and public protests," reads the statement in part. "Mr Assange was informed of Ecuador’s decision hours after Mr Grandi and Mr Kaye met with President Moreno." Mr Assange had critically reported on the Trump administration’s involvement in Yemen and Spanish police brutality. High level representations were made by the Trump administration and the Spanish government over Mr Assange, who was given political refugee status by Ecuador in 2012 over US attempts to prosecute him. “The Trump administrations stepped up efforts to prosecute Mr Assange after WikiLeaks published the largest leak in the history of the CIA last year. “The US has announced that it now considers Ecuador a ‘strategic ally’ and helped it secure a billion dollars in previously withheld loans. “For almost seven months, Ecuador has kept Mr Assange in a regime that has been likened to solitary confinement by Human Rights Watch. Ecuador has prevented Mr Assange from receiving visitors other than his lawyers. It installed three sets of signal jammers in the embassy, to prevent Mr Assange from communicating using mobile phones or internet. “The extrajudicial seven-month isolation of Mr Assange has interfered with his fundamental rights and the rights of his family. It has also prevented Mr Assange from working and giving public talks. “Ecuador has also prevented all journalists from speaking to him during this time. Ecuador’s President until last year, Rafael Correa, has denounced Mr Assange’s treatment as ‘torture’ stating ‘the government is basically attacking Julian’s mental health’. While Assange's communications have been partially restored, he will still be restricted from expressing controversial opinions under threat of expulsion.